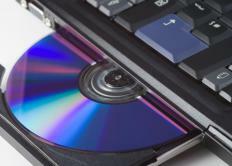 How do I Choose the Best VCD Freeware? Video and audio information may be burned onto a VCD. Choosing the best video compact disc (VCD) freeware program depends a great deal on what it is you want to do regarding the creation of a VCD. If you are looking to burn VCDs, then you will need VCD freeware that will allow you to burn a movie onto the disc. There is also some VCD freeware that will help you rip video from a digital versatile disc (DVD) and then allow you to burn it onto a VCD. You should look for a program that will do what you want it to do, but also be careful to only download from reputable websites to better avoid malicious software. A VCD is a compact disc (CD) that looks similar to an audio CD, but allows a person to burn both video and audio information to the disc for playback in a number of different machines. These types of discs were quite popular in the late 20th century, but as DVD technology became more affordable and accessible for users, VCDs fell in popularity. They are still used by many people, however, and can store video and audio at sufficient quality for numerous applications. You should also consider if you need VCD freeware that can also rip video from another source, such as a DVD. This may require a more complicated program, and you may also need a program that can convert video formats between what is ripped from a DVD and what can be burned onto a VCD. It can often be easier to simply download one VCD freeware program for ripping from a disc, and another program for burning to a VCD, one of which should also be able to convert in the process. You should also keep in mind any copyright laws in your region, and be sure that you are not illegally ripping or burning copyrighted materials. How do I Convert VCD to MPEG? How do I Convert AVI to VCD? How do I Choose the Best MPEG Freeware? How do I Convert VCD to DVD? How do I Convert FLV to VCD? How do I Burn a VCD?